Looking for a new Super Nintendo game to play on your emulator? 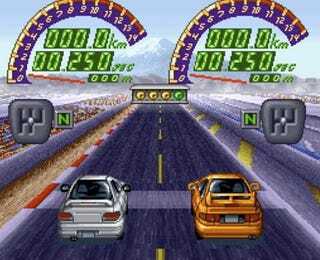 Well if you want a super-realistic racing experience then a Japanese drag racing game called Zeroyon Champ is probably your best bet. Now, you may not be able to take any corners on a winding circuit, but what you lack in steering control is made up for in shifting control. After all, swapping cogs is what really matters when you're goin' down the strip. Yes, this game originally from 1995 requires you to operate the clutch and the shift lever— all on your standard controller. You've got one button to accelerate, one button to operate the clutch, and you use the D-pad (or arrow keys on your computer) to maneuver the shift lever. If that interface isn't enough to entice you, there's also a nice selection of hot JDM machines like the Nissan Skyline GT-R, Mazda RX-7, Subaru Impreza, Mitsubishi Evo, and even a "Fanny Car." If you're fluent in reading Japanese, the game also has a RPG-ish story mode, but it probably won't make much sense if you're monolingual. If you've got a Nintendo DS there's apparently a new version of the game, but we're sure it doesn't have all the 16-bit goodness of the original.